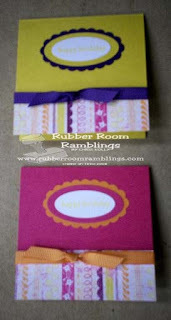 Rubber Room Ramblings: SCALLOP ENVELOPE STATIONERY BOX! This is a great little box with four 3x3 cards inside! Nancy used two Scallop Envelope Big Shot Dies and put them together to make this little box that holds four 3x3 cards with envelopes. 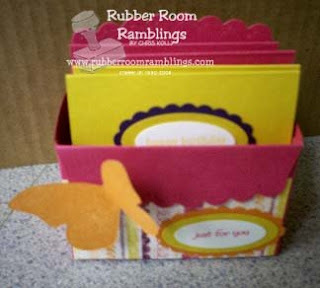 She used a little piece of the new Razzleberry Lemonade Designer Series Paper to decorate the front of the stationery box and then cut a little buttery from the Big Shot Butterfly Die to add even more dimension to the box. We made two of each of the little cards to go inside the box. We used the sentiments from the Teeny Tiny Wishes stamp set for the cards with the large oval punch and the scallop oval punch; then we added a little DSP and some ribbon to each card. This is an easy little project and it would make a very nice little gift! Thanks for sharing this with us, Nancy!